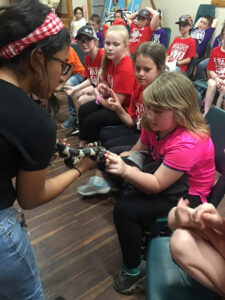 Every April for the past 11 years, Glen Rose Intermediate School (GRIS) third graders journey to Fossil Rim Wildlife Center for a day of education, enlightenment, and, of course, fun. 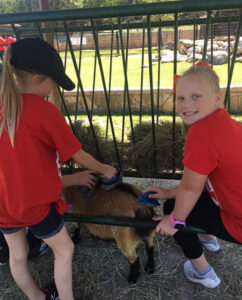 That “journey” is a whopping 7.5 miles to the Fossil Rim Overlook area, but the wildlife center is a foreign land to many of these students before they reach third grade. 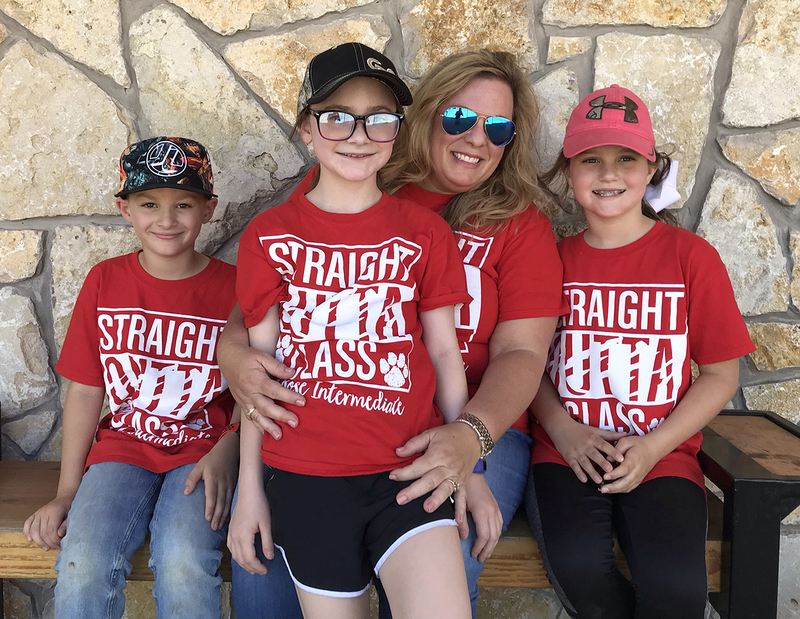 Glen Rose Intermediate Teacher Candace Stegint is pictured with her third graders who were interviewed for this article, including (from left) Jack Gartrell, Bryar Sanders, and Hartley Evans. 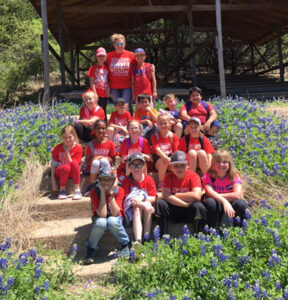 Each April, more than 100 Glen Rose third graders visit Fossil Rim for free – many for the first time. “We asked for a show of hands this morning, and about 40 percent of the (121) students hadn’t been to Fossil Rim before,” said Candace Stegint, a third-grade teacher at GRIS. “I always hope the students come away from this visit with an appreciation for nature. I want them to value the animals, plants, and land – have a love for life. Including teachers, the crew of 130 people divided into four groups – Giraffe, Zebra, Rhino, and Cheetah – when they arrived as the park opened on April 9. 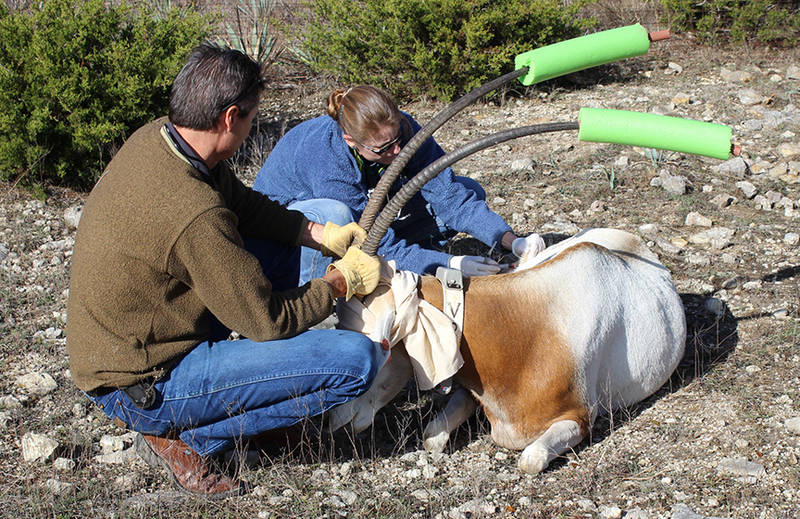 Two of the groups began with a guided tour and visit to Fossil Rim’s compost facility. 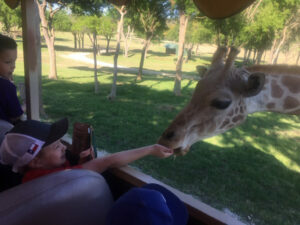 No visit to Fossil Rim would be complete without giraffe feeding. 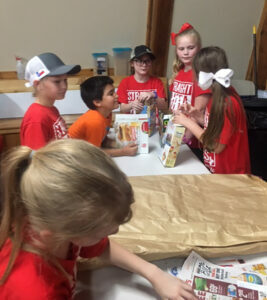 Meanwhile, one of the other groups went on a nature hike, while the final group headed to the Children’s Animal Center (CAC) to make enrichment items for the exotic birds and learn about animal training. Each group rotated until it had completed all activities, with only lunch halting the action along the way. Stegint’s Rhino group began with a guided tour and compost facility visit. “We saw giraffes early in the morning, and they are always a favorite, along with cheetahs and rhinos,” she said. 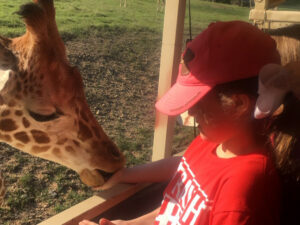 “Some of the kids are hesitant at first, but everyone on our bus (hand) fed giraffes. 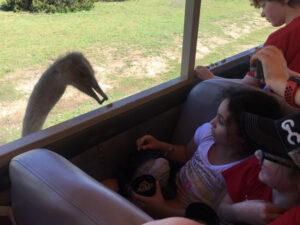 We saw an ostrich, and everyone enjoyed when it came up to the bus. From red deer to fallow deer, the students like to see all the different varieties. Much like giraffes, ostriches are happy to provide a close encounter of the feeding kind. April is always a great month to visit Fossil Rim, a notion with which Stegint concurred. The teacher was happy the students were able to see Fossil Rim from the guided tour perspective, at least this once. Every goat needs a good brushing, and these students were up to the task. Stegint stressed how much it means to the students to feel like they are involved in something. For example, making enrichment toys at the CAC and then getting to watch the birds enjoy them was “so cool”. She also explained why the school actively contributing to Fossil Rim’s compost efforts is such a big deal. Third graders Jack Gartrell, Bryar Sanders, and Hartley Evans were kind enough to share some of their thoughts on the visit. The first question asked was what they were most looking forward to about the day’s activities. “I think it was getting to see the animal I’ve done my research about, the African (spurred) tortoise,” Gartrell said. “I really wanted to go on the hike, too,” Evans added. 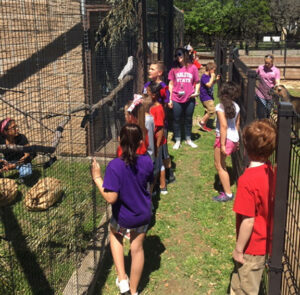 Students made enrichment items for the exotic birds at the Children’s Animal Center and then were able to see the birds enjoy their creations. The students were asked what their favorite part of the day ended up being. “I loved seeing the ostrich, because it reached over the seat trying to grab my friend’s food,” Sanders said. They were asked what was surprising about the visit. Gartrell said he has been to Fossil Rim several times and so he was not caught off-guard. “Making a (enrichment) toy for the birds; I had no idea we were doing that,” Sanders said. “Getting to pet a snake,” Evans said. Finally, the students were asked about something interesting they learned, and Stegint even contributed a factoid. “Cheetahs have black marks under their eyes that help keep the sun out,” Sanders said. Candace Stegint is pictured with her third-grade class. “I agree with Bryar,” Evans said. “I learned that, instead of being nocturnal, cheetahs are diurnal, which means active during the day,” Stegint said. From a logistics perspective, a group of 130 people is quite an undertaking for Fossil Rim’s education department. “I think their visit went really well,” said Assistant Director of Education James Morgan. “The kids who took the first round of tours probably saw more animals. It was warm for an early April day, but the breeze on the bus and on the hike made it feel nice. “This is a big event for our department requiring a lot of energy and effort, but we try to make every event memorable, large or small. If we get bad weather, we adjust and make sure guests still learn and have fun. 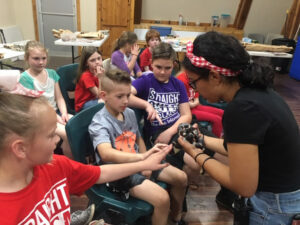 Children’s Animal Center Intern Adriana Duran helps the third graders get to know Fossil Rim’s kingsnake. Bullard expanded on the visits to the compost facility and CAC. 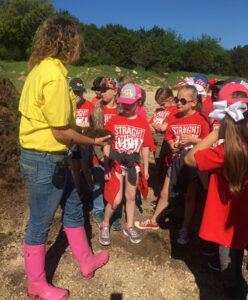 “It’s a cool connection between Glen Rose schools and Fossil Rim when it comes to the compost, so I’m glad they got to visit that area,” he said. “They already know Caitlin from school, but now they see where she works and see how everything is connected. We also want to thank (CAC Supervisor) Kristina (Borgstrom) for giving her time and sharing her knowledge of animal training and enrichment. Kristina brought out our corn snake and kingsnake, which was a nice addition to the experience. Morgan is thankful for the cohesive manner in which this event is consistently executed. 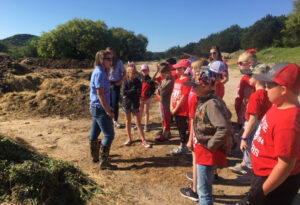 After months of contributing their food waste to Fossil Rim’s composting facility, the Glen Rose third graders finally got to see the compost windrows with a visit to Caitlin Pyle (yellow) and Vanessa Hays. The education department wants Glen Rose ISD, and local citizens in general, to always keep them in mind for opportunities going forward. 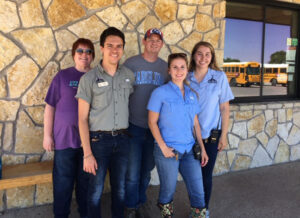 Some of the Fossil Rim staff who did their best to make the third-grade visit great included (from left) Jennifer Arledge, Andrew Bullard, James Morgan, Vanessa Hays, and Conservation Education Intern Kelynn Shafer. This was the first Glen Rose third grade event for Arledge, and she values the relationship with schools, both near and far.